We held Becky’s 6th birthday party at the weekend. 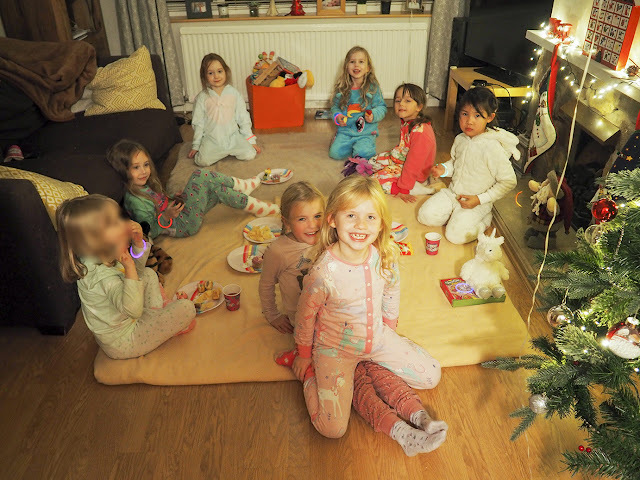 It was a pyjama party for a total of nine girls (one unfortunately couldn’t make it in the end) at our house, and I’ve been agonising over it and planning it for what seems like ages. I just wanted to make it as special for Becky as I possibly could. I think I just about pulled it off, and everyone had a good time (and the house only got trashed a little and I only needed one large glass of wine to recuperate!). Last year I hired a village hall and a disco dance kids entertainer, but I wanted to do something different this year; firstly, because I’m a little wary of having to go bigger and better every year (I mean, if we’re going through such an effort and expense when they’re this little, how are we going to top it every year until they’re 18 or so? ), but also because now that Becky is older, friendships have changed, progressed and evolved, and instead of having to invite huge heaps of kids from school just to cover everyone, there is now a clear gang of girls and strong friendships that have a lovely dynamic, which I hoped would work well in a smaller environment. And that was definitely the case. Because Becky’s birthday is in December and it obviously gets dark very early, I thought a pyjama party would be perfect – cosy and comfy and girly and pink and all the fluffly attributes you can think of. Becky loved the idea, so we went ahead with it and send the invites out. We decided to get everyone over from 4pm to 7pm (a long time, I know!) and do party games, disco dancing, manicures, glitter tattoos and watch a movie, and we did just that. The girls were very excited from the moment I sent the invites out, and Becky didn’t stop talking about it for weeks, she was so looking forward to it. I must admit, as the anticipation was rising in the run-up, I did feel slightly nervous whether I could live up to all the girls’ expectations, but they seemed happy and like they had a lovely time, which was a big relief. As a little gift on arrival, I had bought each girl matching fluffy socks and a glow stick to get them into the spirit of the evening. In my head I had the image that all the girls would wear the same cosy socks and find it funny - I just didn’t make provisions for the fact that some girls were clearly quite attached to their own socks, and a couple politely declined the offer and insisted on wear their own, which still makes me chuckle. You can plan so much, you can pin so many Instagram worthy ideas, but you can never quite predict how it’s actually going to work out when you’re dealing with kids, and especially strong minded little girls. So about two thirds wore matching socks, and the others just wore their own, hehe (but they received the socks in their party bag anyway, so it’s all good). We started off with disco dancing, then played musical statues followed by pass the parcel and charades, which was really good fun. The girls were so brilliant, and such good sports, up for everything, and they were actually a real pleasure to have around. We then stopped for some refreshments and to refuel before the second part of the party began. 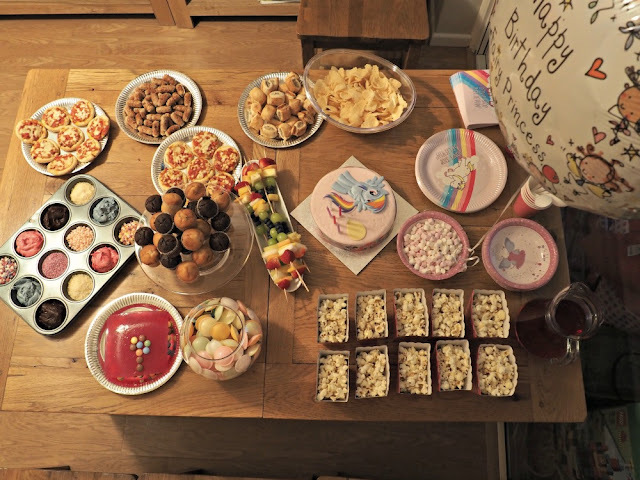 In terms of food, I went with the usual party favourites of mini pizzas, cocktail sausages, sausage rolls, crisps, jelly etc., but I also added a few girly and fun elements, like a cupcake fondue. I basically filled a muffin baking tray with icing, which Becky and I had coloured into pink and light blue (like Rainbow Dash, which was on Becky’s pyjamas), and a load of different sprinkles, hearts, butterflies, hundreds and thousands, popping candy etc. I also bought mini muffins (I think you’re supposed to use fairy cakes, but I found that mini muffins worked better, because of their domed shape). 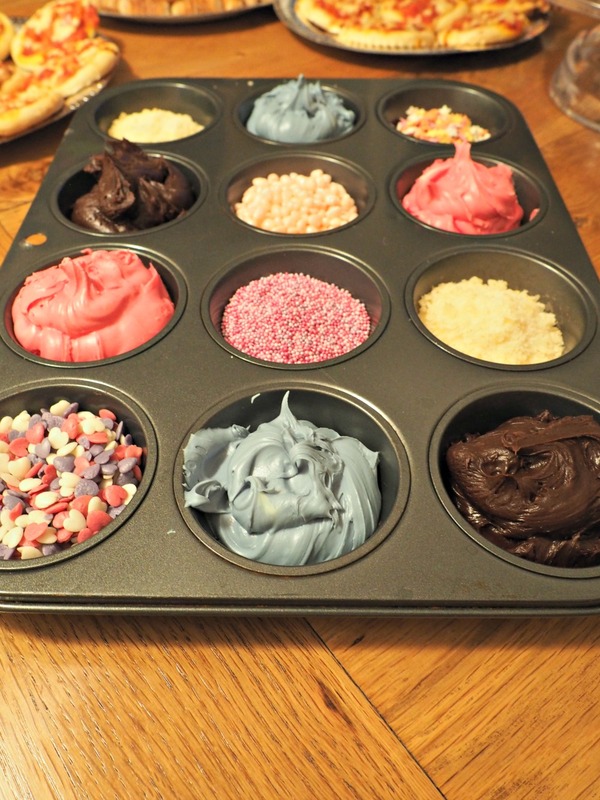 The girls then dipped the muffins into the icing and sprinkles they fancied and devoured the cupcakes. 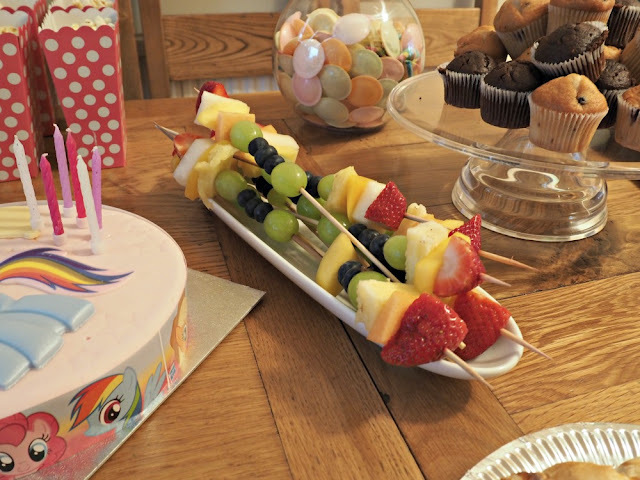 I also made some fruit skewers, which I had only really done to have a healthy option that looked nice – but it went down surprisingly great with the girls, who all had some. 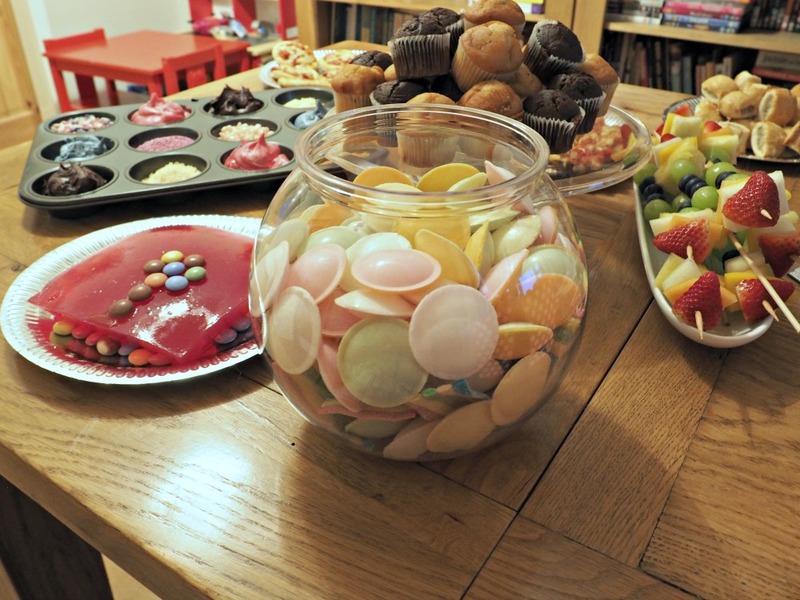 I also filled a candy jar with lots of rainbow coloured candy, and made some glitter jelly, which they also loved. Then they all sat down for a floor picnic and chatted and giggled while munching away. For the cake, I went with a very talented local bakery called Tesco’s (! 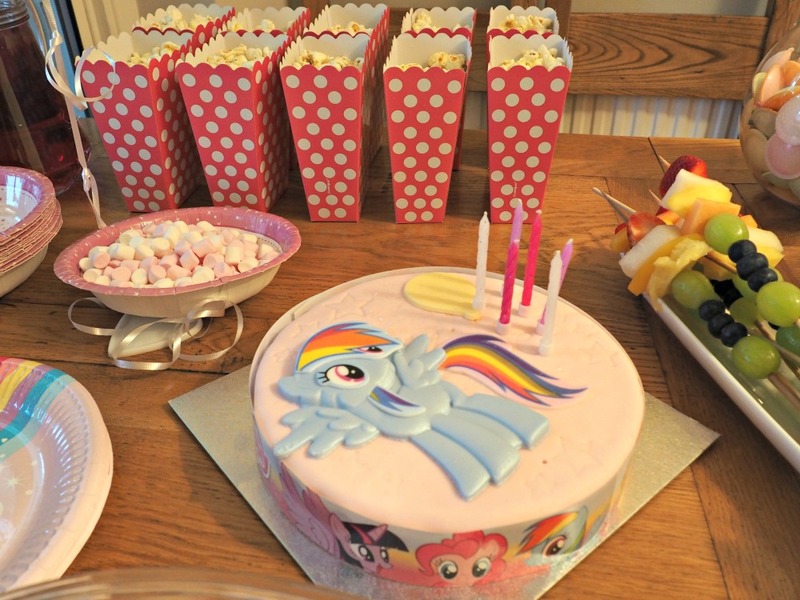 ), which delivered a fab My Little Pony Cake. I have given up on the idea of baking my own cake – I just don’t have the time, and also, even though I am a good baker, and the cakes taste nice, I am absolutely hopeless using Royal Icing, so the cakes I have tried to make in the past are always a visual disaster, so I avoided this altogether by just buying one. Who cares – the girls certainly didn’t, they loved it. At this point I had planned to do some more party games, but I could tell that the girls were getting increasingly impatient for the movie, nail painting and glitter tattoo part of the evening, so we dimmed the lights, put on the movie, distributed the jelly and popcorn and started our little nail bar. (I had planned to do hot chocolate and marshmallows, too, but I got so caught up in the pampering of the girls, I completely forgot – ooops. But they didn’t even notice, I don’t think). 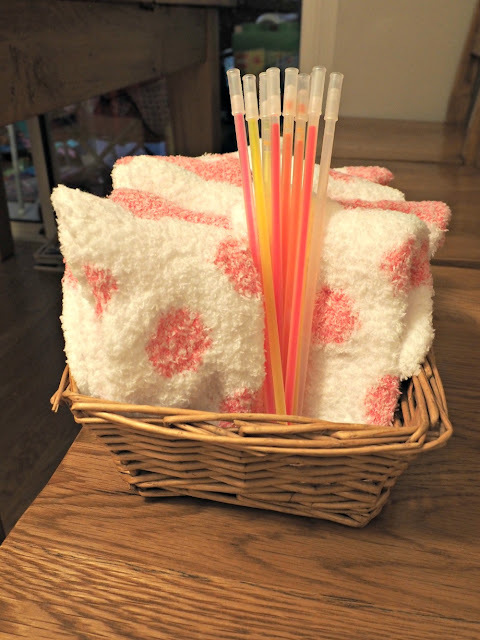 I have to say, I think this was the girls’ favourite part, and if I ever do another party at home again, I will probably do the nails and glitter tattoo again, as it went down a treat and was a lovely activity to do with them. 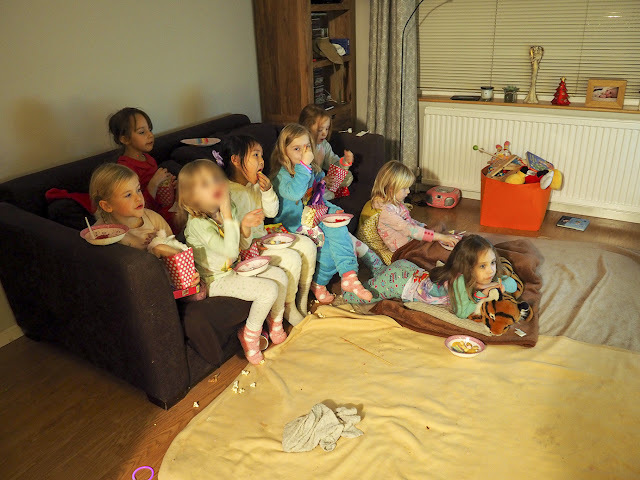 Each girl had pulled out a number from a little sac I had prepared, to keep things fair and square, and while they were waiting their turn, they were watching the movie and huddling together and cuddling up on the sofa, which was so sweet. When everyone had their glitter tattoos, we sang Happy Birthday to Becky and cut the cake, after which all the girls wanted some more glitter tattoos, so we went into round number 2 (and 3 for some). I have to say that considering there were eight girls together, there were no arguments, nothing like that, everyone was so brilliant. I can’t get over what a lovely bunch of girlfriends Becky has. So, all in all, I think it went well. Juggling all activities and the girls on my own (John had gone out with Alex for the duration to keep him out of the way so he wouldn't annoy the girls) was quite full on, but in parts the three hours also went by really quickly. Did it get noisy and messy and chaotic at times? Of course it did, but that's to be expected and comes with the territory when you do a birthday party at home and the kids stuff their faces with E-numbers and ride on a sugar high. But I had made provisions for it; I had moved anything breakable from the living room, covered up our white wool rug with blankets - and that’s about it. Our ground floor area still has the laminate flooring and tiles in the kitchen that the previous owners have put in (we’re planning to install a nice wooden floor at some point) and our carpet on the stairs also needs replacing, so there wasn’t much to trash anyway and I was quite relaxed about glitter and sweet remnants that were stepped on, as well as any drinks and jelly spillages - you have to be. 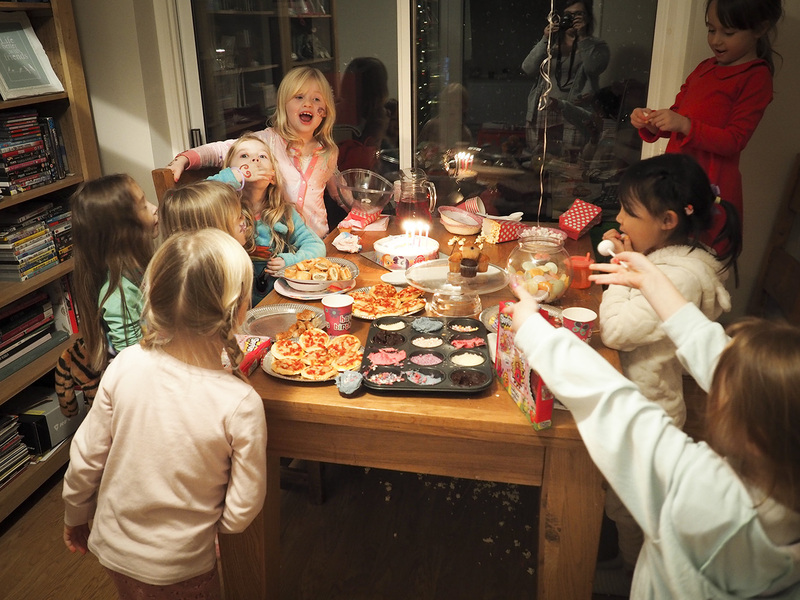 I think all the girls enjoyed themselves, and Becky loved having all her little friends over. 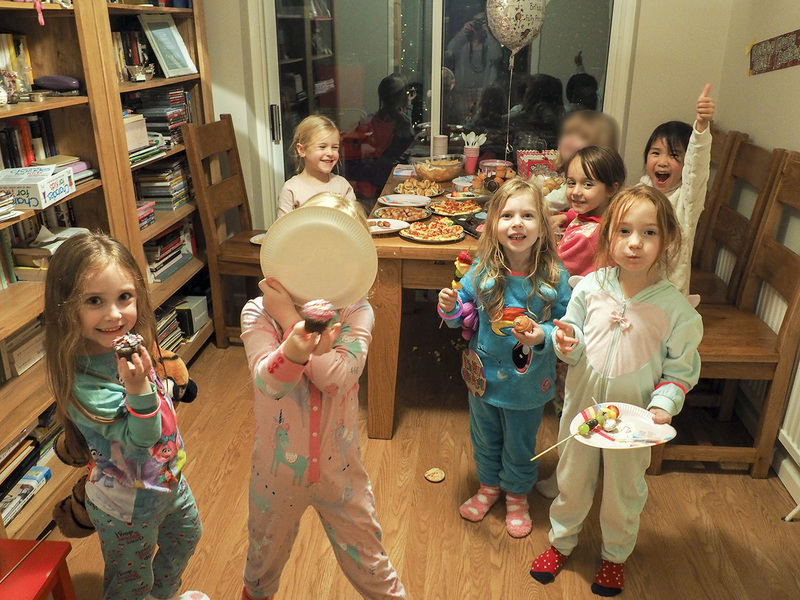 That’s another year ticked off – until the next birthday party.